Deepwater coral reefs in the US Virgin Islands may occupy a much larger area and be in better health than previously thought, based on evidence gathered by a new autonomous underwater vehicle which flies through the sea like a helicopter. Scientists and engineers used an autonomous underwater vehicle and imaging platform called SeaBED during a first-of-its-kind study to determine the health of deepwater coral reefs and related spawning areas for commercial fisheries. While recent reports indicate shallow reefs in the Caribbean and around the world are threatened, this new study found well-developed deeper water coral reefs with nearly 100 percent living coral cover, highly unusual in the Caribbean where disease, pollution, land run-off and other factors have caused widespread coral mortality in shallower reefs in the past few decades. 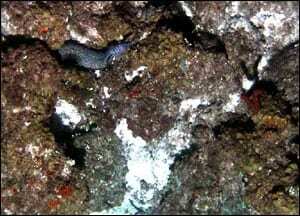 Until now, little information was available on the structure and composition of the deeper coral reefs due to the depths of these insular shelf reefs, which are beyond the safe range of SCUBA diving at 90 to 200 feet deep and some 10 miles from land. Two reef areas, the Marine Conservation District Hind Bank and the South Drop, were surveyed in June south of St. Thomas and St. John in the US Virgin Islands by Woods Hole Oceanographic Institution (WHOI) scientist Hanumant Singh, graduate students Chris Roman and Ryan Eustice, and postdoctoral investigator Ali Can in collaboration with Roy Armstrong of the University of Puerto Rico and observer Liane Guild of NASA Ames Research Center. Scientists from the University of the Virgin Islands (USVI), the Department of Planning and Natural Resources of the USVI, and the Caribbean Fishery Management Council (CFMC) also assisted with the study. The project was funded by the National Science Foundation with additional support from the National Oceanic and Atmospheric Administration (NOAA) and CFMC, which is responsible for protecting marine habitats in waters beyond three nautical miles from shore. The team used SeaBED, developed by Singh and his WHOI colleagues, to take a series of 7,000 digital still images of the coral reef habitats. 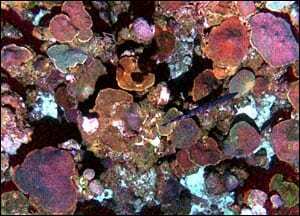 SeaBED conducted nine successful missions at night, when it is easier to image the reefs using strobe lights, on the Marine Conservation District Hind Bank near St. Thomas and the South Drop near St. John. 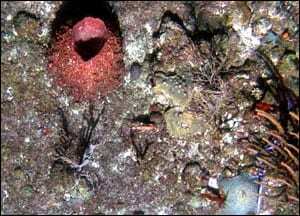 Both reefs are 30 to 80 meters (90 to 265 feet) below the surface, deeper than normally reachable by divers. The vehicle “flew” seven lines, or transects, each several miles long over the banks, collecting color images every three seconds during the week-long project. 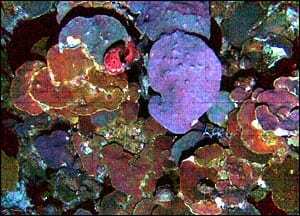 The banks had never been mapped or imaged before, so the diversity and abundance of coral species and the health of the corals was a major surprise. Hind Bank Marine Conservation District (MCD), the first no-take fishery conservation zone in US federal waters, had been a key commercial fishing ground for years. On the recommendation of fishers, scientists and government officials the MCD was closed to fishing and to the taking of coral in 1999 to protect both the reef and the related fishery. Red hind, a type of grouper, is one of the most valuable commercial fisheries in the Caribbean and is still fished in other areas. Seasonal closings in the Caribbean are common to help protect the fisheries, and studies by Rick Nemeth of the University of the Virgin Islands indicate that the size and the quantity of fish in the closed areas on the banks are increasing. Garcia-Moliner says only a fraction of the deep water reefs has been mapped and imaged since SeaBED spent only a week there. 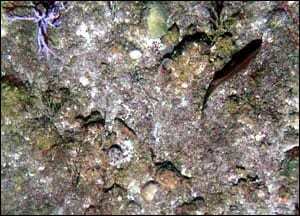 Most corals that need light to survive do not grow at depths greater than 90 meters (300 feet), so much of it may be in intermediate water depths, beyond the range of most divers and too risky for remotely operated or tethered vehicles to work in due to the risk of getting their cables snagged on the rugged terrain. 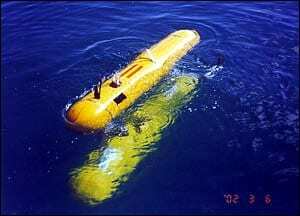 Singh said SeaBED is a perfect tool for this type of project because it is inexpensive to operate, can be deployed from a small boat and operated by one or two people, and can follow the rugged terrain of a coral reef and work to depths of 500 meters (about 1,500 feet). The recent study was conducted aboard the Research Vessel Chapman from the University of Puerto Rico. 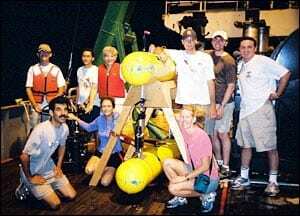 Singh and the Woods Hole Oceanographic team plan to return to the reefs with SeaBED in October 2004. New sensors may be added and the survey area expanded. Annual surveys are now planned to determine changes over time in the health of the reef and its inhabitants. WHOI is a private, independent marine research and engineering, and higher education organization located in Falmouth, MA. Its primary mission is to understand the oceans and their interaction with the Earth as a whole, and to communicate a basic understanding of the ocean’s role in the changing global environment. Established in 1930 on a recommendation from the National Academy of Sciences, the Institution is organized into five departments, interdisciplinary institutes and a marine policy center, and conducts a joint graduate education program with the Massachusetts Institute of Technology. 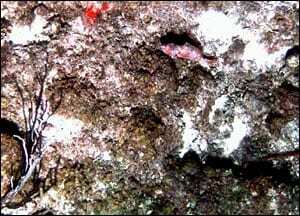 Science Express of Science Magazine; recent report on the health of coral reefs.